You may think having all your teeth taken out, and getting dentures is the end to all your dental woes. But you do still need to have good oral health even if you wear full dentures. Dentures should be cleaned daily by both brushing and soaking. 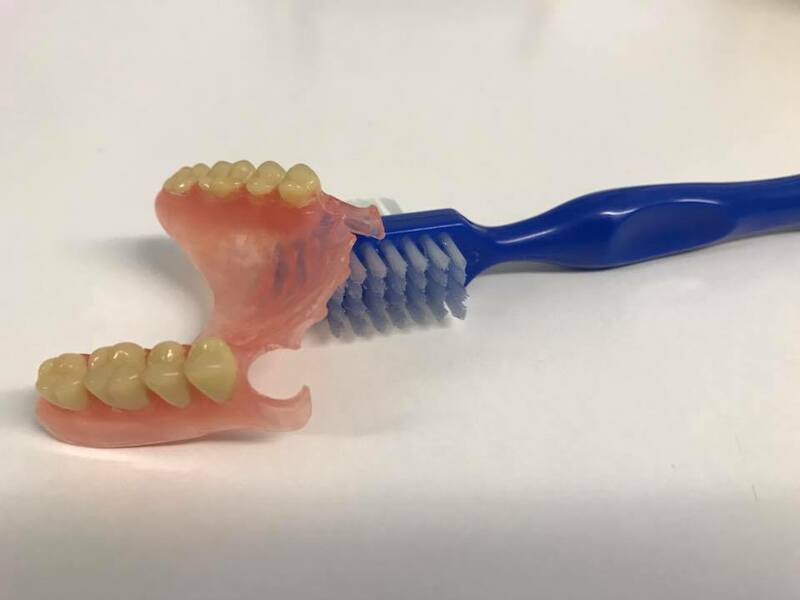 You can use an ordinary toothbrush or a denture brush, which ever you prefer, along with an effective non abrasive denture cleanser (Do not use toothpaste as this can damage the denture, often causing scratches and losing surface material, which can increase the build up of plaque). Brushing your denture daily is to remove food debris, plaque and other deposits. Make sure you get into those nooks and crannies that fit against your gums to remove any remaining denture adhesive. There are many denture cleansers available in supermarkets and high-street stores. 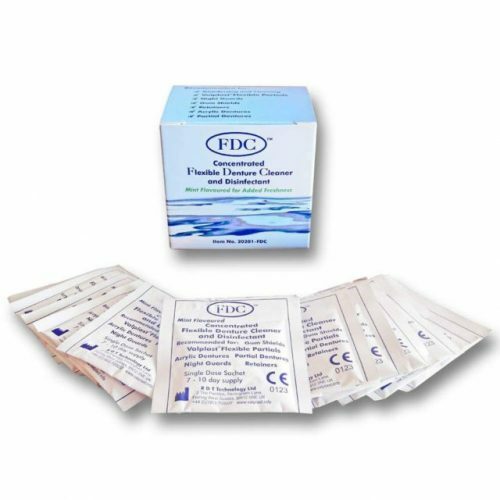 If you wear flexible (Valplast) dentures then we advise to use FDC concentrated denture cleaner, which is available to buy at the practice. It is also recommended that dentures are soaked daily to breakdown any remaining plaque that may have been missed when brushing, and disinfection of the denture. If you can, leave your dentures out during the night, or at another point through the day when possible. This gives your mouth a chance to breathe. Think of it like having a plaster on your hand, the skin needs a chance to breathe. This is the same for the skin inside your mouth. Wearing dentures for longer periods of time can increase the risk of aspiration pneumonia, and denture stomatitis developing. Aspiration Pneumonia is a complication of pulmonary aspiration. Pulmonary aspiration is when you inhale food, stomach acid, or saliva into your lungs. You can also aspirate food that travels back up from your stomach to your esophagus. Treatment; Seek medical advice from your GP. Denture Stomatitis (Oral Thrush) is a common condition where mild inflammation and redness of the gums and soft tissue occurs beneath a denture. Treatment; Good oral hygiene is key, in some cases you may be given medication in the form of lozenges or tablets. If you wear a partial denture then see your dentist as often as they recommend (usually once every six months). However if you wear full dentures and have no teeth, then it is still advised to visit your dentist once every 2 years. This is so we can check the rest of your mouth is healthy, including a mouth cancer screening.